Wildfire Analyst® is software that provides real-time analysis of wildfire behavior and simulates the spread of wildfires. Simulations are completed quickly, in seconds, to support real time decision making. For wildland fire, time is of the essence, and Wildfire Analyst® was specifically architected to support initial attack situations, giving the Fire Chief and Incident Commander the critical intelligence needed to support resource allocation decision making. 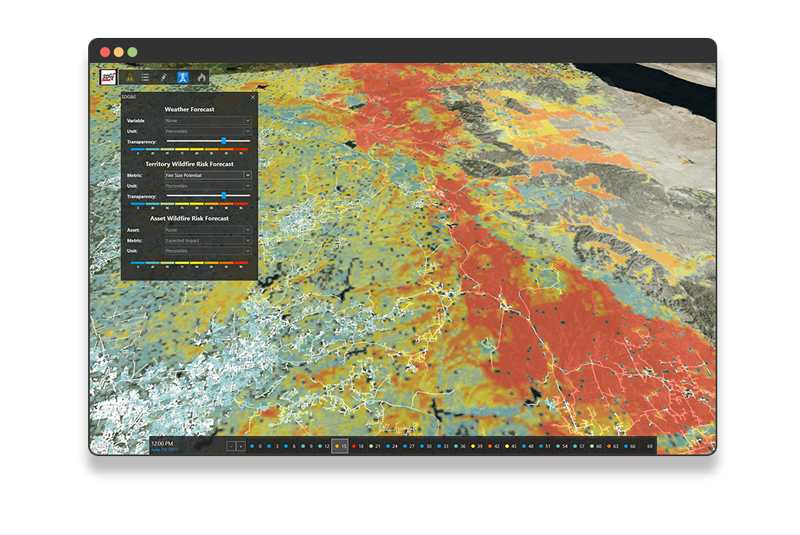 Wildfire Analyst® provides a range of analytical outputs, available as GIS maps and charts, that empower more accurate and timely decision making. Whether through the desktop platform, or web and mobile enabled applications, capabilities and results are deployed to those who need it, when they need it, without delay. Wildfire Analyst® is a software component of Tecnosylva’s incident management software suite. 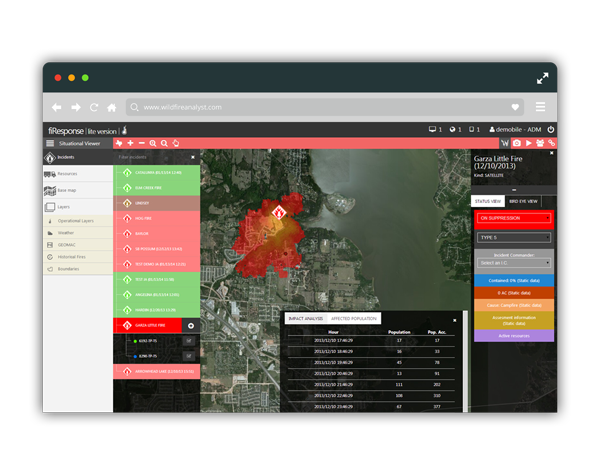 WFA provides seamless integration with our fiResponse® platform, to provide real time information about where a fire is likely to spread and what potential impacts may be – in seconds. Wildfire Analyst® provides critical information to support the resource dispatching and allocation. Contemporary fire behavior software tools required a high degree of specialization, training and effort in the preparation and conversion of GIS data to use the software. Historically, this has been a limitation in using these tools for initial attack and real time applications. Wildfire Analyst® was specifically designed to address this issue, providing analysis capabilities for a range of situations and users, with minimal knowledge of GIS data required. Wildfire Analyst® provides seamless integration with Esri’s ArcGIS with no conversion or pre-processing required. This greatly increases usability, allowing users to concentrate on interpreting simulation outputs, and making important decisions about how and where to deploy firefighting resources. Wildfire Analyst® provides a comprehensive set of outputs for each simulation that is tied directly to the time stamp of the weather conditions and data inputs for an incident. The real time performance allows you to create multiple simulations for an incident, easily and quickly, reflecting changing conditions and response tactics during the incident lifecycle. Conventional fire behavior outputs such as rate of spread, flame length, fireline intensity, crown fire potential, among others. High definition wind field generation. Time of arrival and fire perimeters at any time interval desired. Fuels mapping and adjustment based on observed conditions. Many other outputs and options are available. 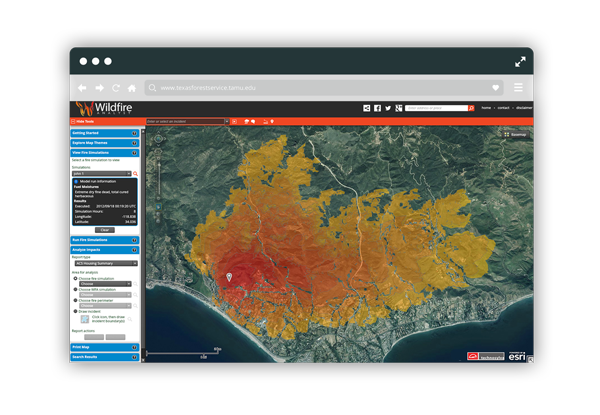 Wildfire Analyst® was designed to be used with a laptop or tablet at the incident command center, in the operations center, or directly on scene, providing outputs in less than a minute. The software can use predefined weather scenarios, or current and forecasted weather obtained via web services, to model fire behavior and provide outputs within seconds. This fast performance facilitates use of the outputs in real time, and allows for constant adjustment based on field observations and deployment decisions by the incident team. Wildfire Analyst® is a powerful tool in the arsenal of the incident team, providing simulations very quickly, and repeatedly as changing conditions dictate. The Wildfire Analyst® API provides capabilities to integrate the full range of modeling capabilities into custom applications on any desired platform – including mobile apps. This is ideal for using custom or proprietary weather data services and deriving custom outputs tailored to a specific customer need. The Wildfire Analyst® API is ideal for use in the electric utility, finance and insurance industries where providing real time results, by integrating proprietary data, is essential to meet the unique needs of companies and their customers. For more information about Wildfire Analyst®, download the WFA brochure or visit the Wildfire Analyst® website. If you’re interested in seeing how Wildfire Analyst® can benefit you. Don’t hesitate to contact us for a demo today!